The Bizagi ODS is a powerful option that enhances availability and performance of your transactional database. 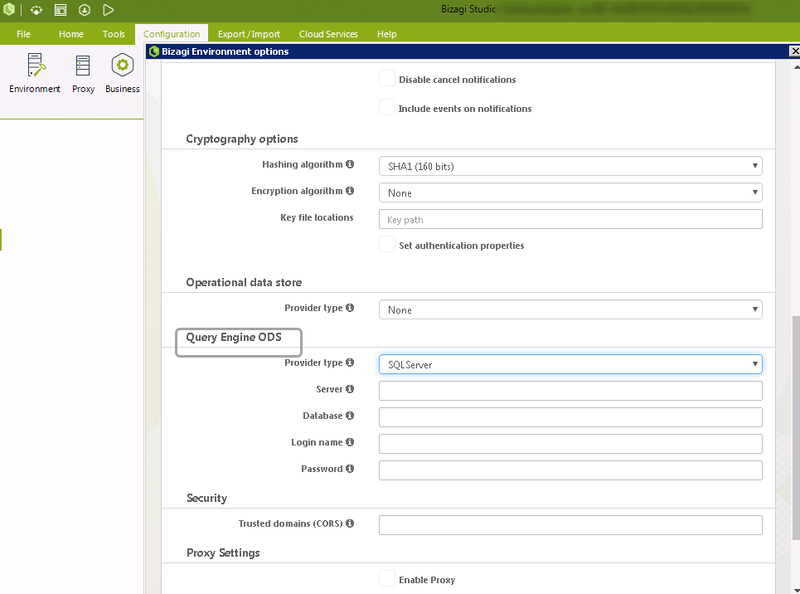 Once you have set up a copy of your Bizagi database, configure the connection to the ODS in Bizagi. Do this using the Bizagi Management Console for any environment (Test or Production). For introductory information and to review prerequisites for this option, refer to Setting up a Bizagi ODS. •Server: The database instance which is the ODS. •Database: The replicated database (ODS). •Login name: The login account used for the connection to that database. •Password: The password for the login account used for the connection to that database. •Username: The user schema representing the replicated source. •Password: The password for that user schema. •The replicated database is configured by the client. The client decides whether to keep the database replication live. •If the replicated database is currently offline, this feature automatically retrieves data from the operational project database. •Since the Query Engine only reads the database, there are no transactions. Hence, there is no control of commit or rollback. •Replicated databases must be from the same engine. Ie. SQLServer - SQLServer, Oracle - Oracle.